In my How to Home Preschool series published recently on In Lieu of Preschool, I talked about involving friends and family in your homeschool (see letter U for us). The kids’ Oma came to visit this week and she brought a whole, real coconut to share with us. Honestly I’ve always been intimidated by coconuts in the shell, and so the kids had never really even seen one. It turned out to be a really great learning experience for us all! It’s just another example of why it can be good to get others involved, whether you homeschool or not, because everyone has something to offer!! By chance, I had recently watched this video which shows how to open a coconut and it works REALLY well. You only need to watch from about 1:00 to 3:00 to see how to open the coconut; the rest of the video is about how to make coconut milk. First we drained out the coconut water by poking holes through the eyes and pouring the liquid into a container. Oma did this with a screwdriver. She gently pounded it through the holes with a hammer. Then we used a hammer instead of the back of a knife like in the video to hit the shell around the middle, and it split open in only a couple of whacks. Who knew opening a coconut was really so easy?!?! The kids had fun taste testing the coconut water and the fresh coconut meat. Neither of my kids was a big fan of the coconut water — more for me! — but my 3 year old LOVED the fresh coconut meat and my 4 year old at least tried it before proclaiming his dislike. I think exposing kids to a variety of foods is great, and it helps to start early with encouraging them to at least sample new foods! Often it takes multiple exposures to a food before a child will start to like it, so keep sampling!! 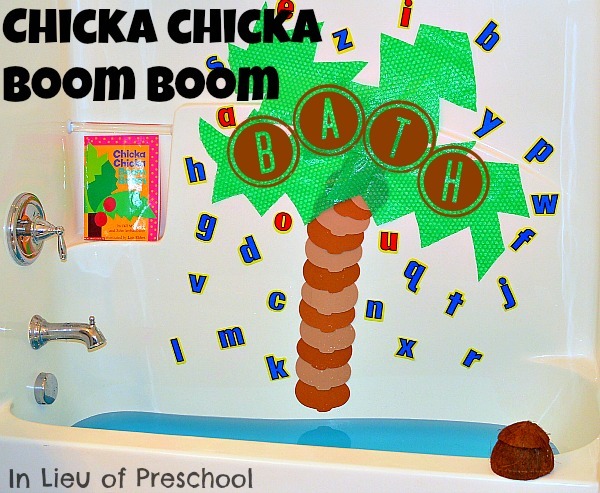 When we finished, the coconut shell actually inspired a fun storybook bath time: Chicka Chicka Boom Boom bath. We read the book while the kids practiced letters and then they played with the coconut shell in the tub. It made a great hat, bowl, colander, and boat! Click here to see the bath post. We had lots of fun with our coconut and learned quite a bit, too! I’m actually looking forward to getting another coconut soon! Coconut Volcano Science Experiment – the kids’ FAVORITE! !